The balance of power in Iraq which has emerged as a result of the central government’s operations against Kurdish forces in the disputed territories in October 2017, has certainly proved a headache for the United States and other Western actors, but it has not produced a catastrophic outcome for Western interests. On the contrary, Prime Minister Haider al-Abadi has emerged strengthened from his conflict with Erbil, and with his standing among Iraq’s Arabs vastly improved as a consequence. Washington’s ‘one Iraq’ policy, a position which it has held since 2003, looks under less threat than at any time in the past decade. Key actors in the counter-ISIS coalition such as the US, the UK and France – who had sought a close working relationship with both Baghdad and Erbil in their fight against ISIS – preferred the maintenance of an awkward status quo, in which de-facto Kurdish authority in the disputed areas of Iraq was never recognised de jure, but nor was it challenged. 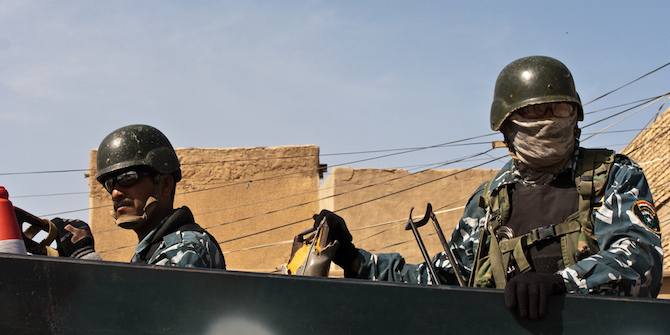 Operations against ISIS had resulted in a workable mix of forces spread across northern Iraq which proved resilient against any resurgent ISIS presence. These forces maintained a working relationship – albeit cold and marred by tension – that was effective in taking territory from ISIS, and displayed a commendable level of command and control. The politics of control on the ground was for sorting out at a later date, long after the scourge of ISIS had been removed. Iraq finds itself in the vice of two key US foreign policy objectives: 1) To destroy terrorist groups such as ISIS and Al Qaeda, and 2) the containment and roll back of Iranian influence in the Middle East. As ISIS control has begun to wane across Iraq, the second pillar of US policy has assumed increasing importance. The primary vehicle for US containment of Iranian interests has been the empowerment of the prime minister at the expense of Vice-President Nouri al Maliki, widely viewed as a major vehicle for Iranian interest to proliferate inside the country, and close to a number of Iranian aligned militias operating in Iraq under the umbrella of the Popular Mobilisation Forces (PMF). The decision by Kurdistan Region President Masud Barzani to upend this uneasy status quo with a referendum on independence was therefore unwelcome. Barzani’s decision was seen by Washington as fundamentally destabilising to an emerging political scene in Baghdad in which Prime Minister Abadi was finally able to shake off his ‘war time’ portfolio, and focus more on political stability and economic restructuring necessary for longer term stability to prevail. The October backlash instigated by Abadi against the Kurds came as a surprise to Washington, but little was done to stop it. This until it became clear that the prime minister was taking things too far, by completely neutering Kurdistan’s contact to the outside world, and taking control of nearly all of its energy resources. The Iraqi Government heeded warnings from numerous actors, principally the United States, who urged restraint. This has led to a dominant position for Baghdad in its relationship with Erbil, and likely ensures that security will more or less prevail between the Kurds and the capital for the foreseeable future. With the exception of Kirkuk, major Kurdish population centres, as well as continued KRG control over the Fishkhabur crossing into Northern Syria have been preserved. The much-feared civil war between Baghdad and Erbil has not materialised. Nevertheless, there are still significant areas of Iraq (for example to the north of Mosul, south of Kirkuk and in multi-ethnic towns like Jalawla, and Tuz Khurmatu) where the likelihood of clashes between Kurdish security forces, or rogue bands of armed Kurds and the PMF or federal security forces remains high. Ongoing problems in Salah al Din governorate, where fighting in October 2017 displaced more than 10,000 people, most of them Kurds, are a particular worry. Many Kurds living in Salah al Din and Diyala governorates now live in towns controlled by the PMF, and there is no guarantee of a peaceable future in the current climate. Certainly any Kurdish insurgency, no matter how small, would undermine the image of the Iraqi government as an actor with moral authority, and in particular bring the prime minister into tension with the PMF who would likely try to exact a harsh revenge. The prime minister is popular, but by no means certain to win the forthcoming elections. Thus the question remains as to what the new dynamics on the ground vis-à-vis the Kurds mean for Abadi’s policies moving forward. The conundrum is that the prime minister has seen his popularity rise on the back of harsh anti-Kurdish measures, but the US preference for restraint on the Erbil-Baghdad relationship runs directly counter to one of his most effective election strategies. Accordingly the US will have to accept a certain amount of bear-baiting at Kurdistan’s expense. The key will be to monitor that tensions do not rise to breaking point in troubled regions along the newly demarcated front lines. Should violence flare, any overt US interference would risk undermining Abadi in front of his constituency at a particularly sensitive time, strengthening harder line elements in the Shia community, such as Qais al Khazali who have little patience for Kurdish sentiment and who have continuously stressed that the US has no role to play in Iraq, and should leave immediately. Abadi’s struggle to contain more rambunctious factions within the PMF is a delicate balancing act that requires sensitivity and skill, but in this election season it is not in the prime minister’s interests to forcibly integrate the militias, nor seek their dissolution. The PMF are particularly popular in southern governorates and have their own political ambitions. The Badr Brigade will lead a PMF list in the next election under the leadership of Hadi al-Amiri, which poses a challenge to the prime minister and his Victory and Reconstruction list in key Shia constituencies. The task is simply too time consuming, and too risky to Abadi’s own political strength to consider. Rather than confronting al-Amiri the prime minister has preferred cooption and accommodation. However an attempt in early January to bring in the PMF list to run jointly alongside the Victory list has proven unsuccessful. Currently the United States has remained quiet, realising that there is little point in forcing Abadi to walk down avenues where he fears to tread. Accordingly, Washington has provided little to no roadmap on how militias should be integrated into the state. Simply put, they won’t tell the Iraqis what to do. The most likely strategy is that the US will wait for the outcome of the elections, and hope Abadi emerges strong enough to form a coalition that gives him the requisite strength and flexibility to allow for a gradual degradation of the PMF over the coming year or two. The PMF are assured funding until the end of 2018, and so for the moment there is little opportunity for the US or others to constrain more problematic militias. In 2019 more scope will emerge for militia powers to be reduced. This can be done through a combination of natural attrition (for example younger men returning to school, and older men being politely encouraged to leave through the introduction of fitness tests and continual salary reductions), and incentives to PMF commanders to integrate into joint security structures that exist in the Iraqi state. Additionally, the formation of Joint Security Mechanisms in which the PMF play a role alongside local actors dotted around various locations in Iraq would serve to dilute their influence, but still affording their members a role in security provision. Albeit in a vastly reduced capacity. A good example of where this could work would be the K1 base, where PUK Peshmerga could be encouraged to work alongside, rather than against Federal and PMF entities. The PMF would likely resist a drastic reduction to their role, emphasising their importance as a counter-terror force to convince Iraqi politicians and the general public of the need for their existence. Therefore an integration of the PMF’s role alongside other forces is far more likely to work, than expecting them to just pack up and go home. The spectre of elections means that formulating macro Iraq policy beyond May is a futile endeavour. On the ground there is much that will take up American attentions; development assistance and reconstruction, particularly in Sunni areas, are ever present needs. Likewise, building and enhancing security capacity is an ongoing challenge that requires constant engagement, both with Baghdad and Erbil. The twin pillars of counter-terrorism and containment of Iran guide US policy, and will continue to do so for the considerable future. The conflict that emerged between Erbil and the centre ran the risk of derailing both these core US interests, and may still do so. However, for Washington the key is to ensure the peace for the next five months, without appearing an overbearing presence. A difficult balance to be sure, but it is one that is achievable and that will not unduly strengthen Iran’s hand in the coming months. US policy is unlikely to ignore Kurdish concerns, particularly with regard to their financial arrangements with Baghdad, but before the elections there is little hope of these problems being solved. For now, if the Iraqi polity can stumble through to May intact, and without further conflict then Washington will see it as job well done.